I've been a loyal Bartender user for a while. It's a great way to hide Mac Menu Bar items for things you might not use on a regular basis. 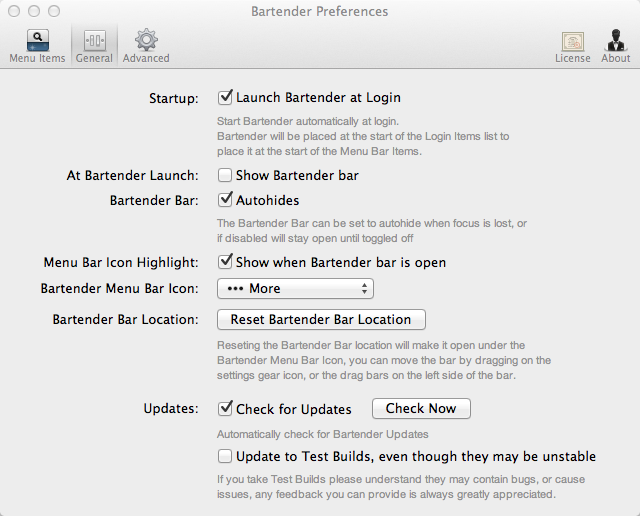 Bartender gives you a single item in the Menu Bar that provides access to the Menu Bar items you place in it. In addition, it allows you to dynamically create rules so items placed in Bartender are temporarily displayed in your Menu Bar when there is activity related to them. For example, if you have Dropbox in your Bartender you can choose to display the Dropbox Menu Bar item in your Menu Bar when there is activity (such as the upload or download of a file). After the activity is complete, the item goes back into Bartender. It's a $15 app and totally worth it.